As a professional restaurant critic, I am always looking out for the best places to eat and drink, for work and pleasure. Last week I was delighted to find this charming Ristorante – seriously fine food matched by a warm atmosphere – on my way to Glasgow Theatre Royal. 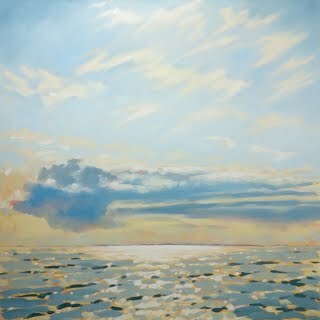 Well the name does mean My Sunshine, from the famous Neapolitan song written in 1898. 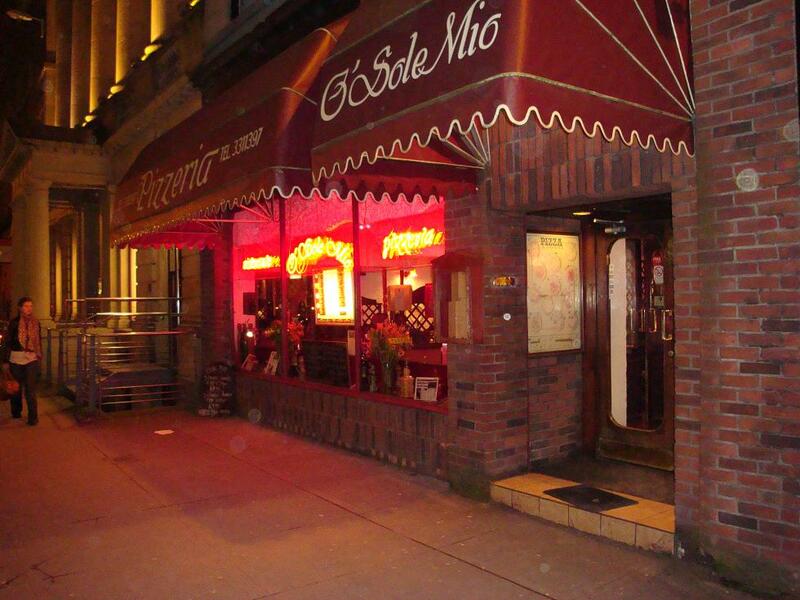 O Sole Mio in a prime location on Bath Street has been a favourite with diners since it opened in 1965. After a change of management in recent years, the new proprietor, Djamel Benouari, formerly at The Art House Hotel and Barca, brings his wide experience in hospitality to ensure hands-on management and attentive service. The design is all about space and comfort, dark wood tables, large booths, Claret red walls and furnishings with a quirky decorative pantile roof. In the Theatre Kitchen see the chefs at work including the Pizzaiolo, the man who kneads the dough and bakes the Pizzas. 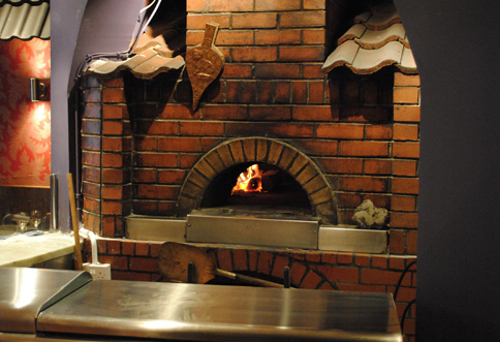 And the Pizzas are cooked in an original Wood Fired Oven which came to Glasgow from Naples, the home of Pizza, in 1965. You can’t get more authentic than this (unless you travel to Italy!). Just a five minute walk from Queen Street Station, it’s the ideal place, as I found, for a pre theatre supper before going to see Scottish Ballet just around the corner. Call in for a business or shopper’s lunch, (an extremely reasonable £6.50 – £9.95); or book a table for a leisurely night out with friends. This is no ordinary Trattoria. The A la Carte menu offers a feast of classic Italian cuisine – Calamari, Carpaccio of beef, (invented at Harry’s Bar, Venice), Vittello alla Milanese, Risotto di Mare, Tuscan Sausage, Lemon Sole, Fritto Misto. Family favourites – Minestrone soup, Bruschetta, Spaghetti alla Bolognese… and a lot more besides. 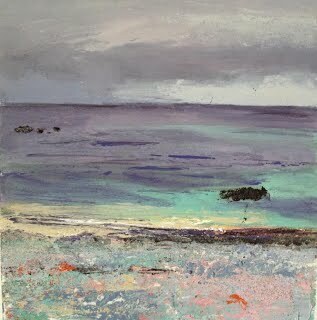 Plus the Daily Specials which last Thursday were Fish Soup, Veal Stew and for the Catch of the Day, Grilled Cod with potatoes, tomatoes and capers. What is excellent value is that these dishes are also offered on the Pre-theatre menu (2 courses, £12.95). As there is a traditional wood-fired oven, I was tempted by a real Pizza. Pizza Pescatore. As an appetiser I sampled Arancini con Mozzarella e Basilico; the Saffron yellow creamy rice ball was served with a delicious sweet & sour chilli jam. Very tasty. I sipped a glass of House Wine, Pinto Grigio, crisp and dry and cold. And then my giant Pizza arrived, smothered in a rich tomato sauce and a pile of shellfish: mussels, clams, squid, and big fat prawns. (A finger bowl of warm water was provided). This was a perfect Pizza, thin base, thick but soft crust and the flavours of the seafood turned a simple dish into a gourmet treat. I did actually eat a few slices by hand! I am not the only one who love the very special pizzas here. A recent Trip Advisor diner wrote, “Simply the best pizza we’ve had, by a margin”. Over supper, I loved the background music soundtrack – chillout, funky jazz, popular classics – to create the right mood day to night. Whenever you may plan to visit, you are sure to be greeted by Mr Benouari and his smiling staff and enjoy a superlative Italian meal. I shall be back soon.! 34 – 36 Bath Street, Glasgow G2 1HE. Check out the website for Reservations, Takeway service, Menus, Christmas meals and more. 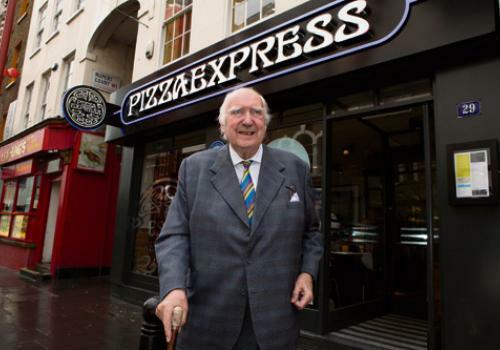 The first germ of an idea to bring authentic Italian Pizza to the UK was originally inspired when Peter Boizot as a young lad, tasted his first pizza in Florence in 1948. Fast forward to 1965, when an oven was brought from Rome to set up the first Pizza Express in Wardour Street, Soho, followed by a second branch in Bloomsbury. The appetite for quality, freshly baked pizza continues to grow with over 16 million happy eaters visiting the company’s 400 restaurants in the UK and Ireland each year. In a prime site for tourists, (Westminster Abbey), Art lovers (Tate Gallery), and for leisure and business visitors, (beside the Doubletree by Hilton hotel), Pizza Express Millbank is a ground floor restaurant, bright, light, contemporary space with high glass walls of windows all around overlooking the Thames. 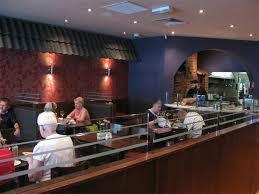 PizzaExpress has always known its broad clientele of all ages, welcoming couples, party groups and families with kids. 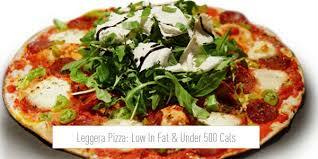 Yes, this is fast food but the Italian classic can be very healthy too. The menu has changed over recent years with a wide choice of low calorie chicken salads, vegetarian and gluten free dishes and also cheeseless, tomato base pizza. And the chefs seem to have fun inventing enticing new Pizza toppings crammed with seasonal vegetables to ensure we stick to a five a day diet. 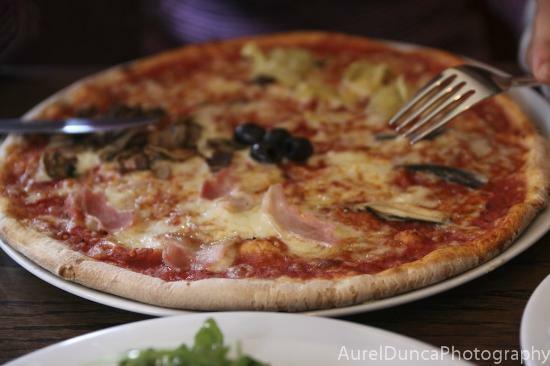 So what to choose from the extensive selection of pasta, risotto and of course those famous Pizzas? 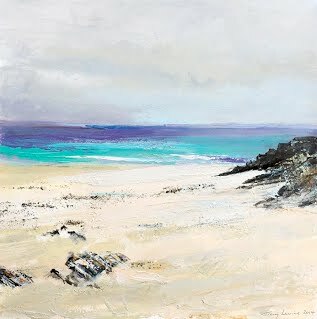 My partner Ken and I had travelled by East Coast train from Edinburgh to London that afternoon, checking into the Grosvenor hotel, Victoria Station. The next day we were setting off on a luxury journey on the Orient Express to Venice. So PizzaExpress was an apt start to our Italian adventure. We began with a glass of Prosecco (fizz for under a Fiver), and shared a bowl of giant Sicilian green olives. We bypassed the tempting bruschetta and garlic bread. Ken then chose the new Emilia Romano Pizza – Chestnut mushrooms, goat’s cheese, garlic oil and mozzarella sprinkled with rocket, grated Gran Moravia cheese, fresh lemon juice and black truffle oil. The verdict – a wonderful combination of earthy flavours and the lingering, rich taste and scent of truffle creating a truly gourmet meal. Another huge vegetarian pizza for me: The Giardiniera covered in juicy artichokes, mushrooms, red peppers, marinated santos tomatoes, leeks, olives, garlic oil, tomato and pesto. 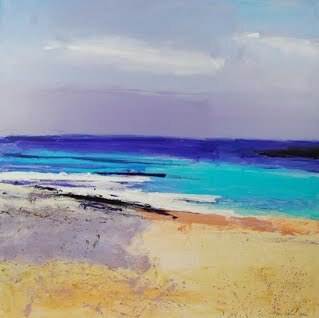 As colourful as the Italian flag with the taste of the Mediterranean sun. We sipped a soft fruity Sicilian Syrah – raising our glasses to toast our exciting train trip. We declined dessert, but you can indulge in Gelato, Chocolate torte and other sweet things. Open Monday to Saturday, 11.30am to 10.30pm, Sunday 11.30am – 5pm, PizzaExpress Millbank is the place for an Express or leisurely lunch, pre-theatre supper or a relaxing dinner as we experienced. The prices for a substantial meal offer good value. 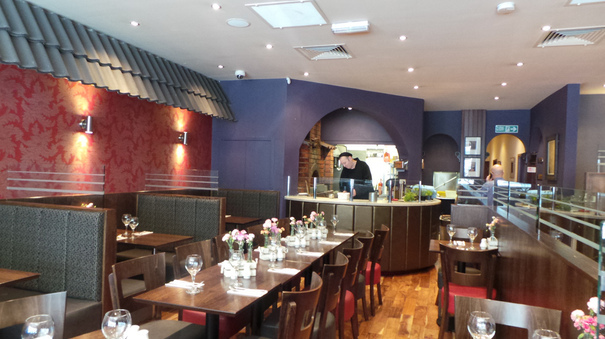 The restaurant is available for venue hire, there’s outside dining and a take-away service. You can even order your Takeaway meal on line for convenience. It’s time to celebrate the company’s forthcoming 50th birthday with a feast of delicious Italian cuisine. And you don’t have to fly to Naples or Rome or Florence to experience it. “We love this branch of Pizza Express because it’s in an excellent location, has wonderful staff and the food is of great quality. Beautiful, unique building which is very light – lovely to watch the world go by. 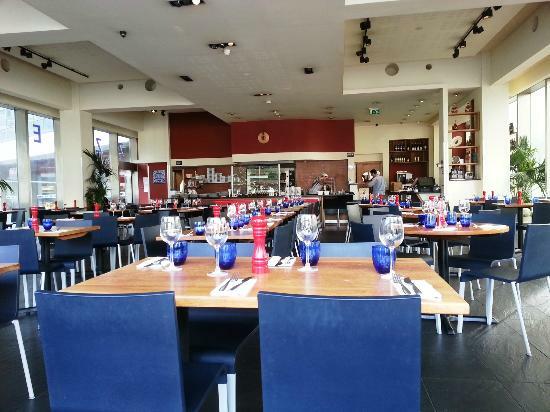 Although Pizza Express is a chain each branch has its own special charm and I highly recommend Millbank” Diner Review. Hoteliers and Restaurateurs can have the funding, innovative designers, architects, a champion chef and a brilliant bartender, but what you can’t buy is the perfect ambience. What does help is preserving the heritage of a building through design and décor, tracing a link with the past to the present to create an authentic sense of place. On the edge of the New Town in Edinburgh, Raeburn Place was built between 1814-25 in the estate owned by Henry Raeburn the portrait painter, featuring grand villas, one of which was Somerset Cottage. In the 1960s it was transformed into the Raeburn House Hotel, but after falling into disrepair, it finally closed in 2007. Thankfully, the abandoned property was bought four years later by the Maclean family, undertaking a major refurbishment project to preserve and enhance the prime Georgian architecture. 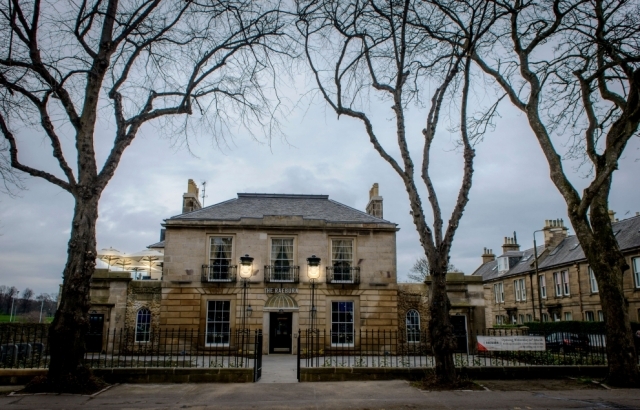 The Townhouse hotel opened again in April 2014 with ten bedrooms, bar, restaurant, beer garden and outdoor terrace, private dining room and conference suite. Within a month, it was named Boutique Hotel of the Year, and given a special merit for Exceptional Achievement at the Scottish Hotel Awards. My partner Ken and I stayed overnight to experience the new look Raeburn hotel, checking out every aspect of guest care from check in to interior design, pillow test, dinner and breakfast. 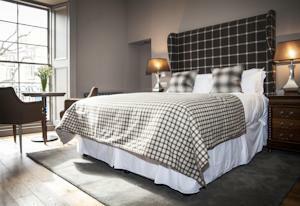 Our room Number 5 is stunningly designed with sumptuous tweed fabrics, cool grey painted bespoke wood panelling with fine attention to guest comfort and homely facilities. For those who cannot exist without gadgets and entertainment – Smart plasma television, Wi-Fi access point, Bose Airplay box + iPod (pre-loaded music). Your morning coffee fix is sorted with an espresso machine and mini bar is stocked with complimentary water, as well as drinks and snacks. Be amazed by a huge walk in wardrobe with dressing table, hair dryer and GHD straighteners. 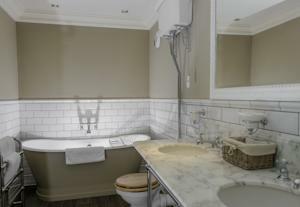 Sleep under Egyptian cotton and indulge in the traditional bathroom with Rainforest shower and (in six rooms), a Roll top bath; quality toiletries, soft towels, slippers and gowns. I love the use of the R logo to signify a strong brand name of a design hotel. Time to explore downstairs and as it was a glorious summer evening, we took a seat outside under a sunshade and were soon sipping a glass of crisp, refreshing Chenin Blanc. Thie first floor Terrace overlooks the historic Sports grounds – the first Rugby international between England and Scotland was played here in March 1871. The Royal Botanic Garden is just a short walk away too – such an excellent location to stay for a few days and explore all the visitor attractions of the city. 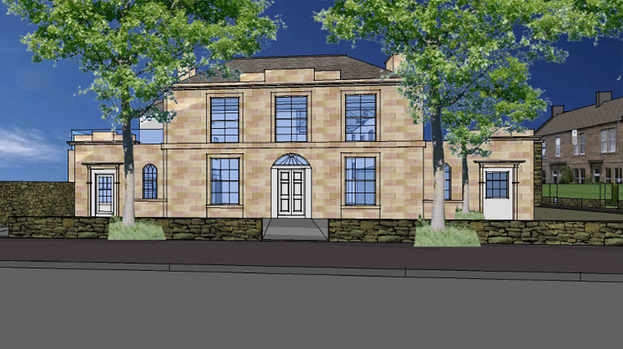 Stockbridge is an upmarket neigbourhood of families, students, young and retired couples. 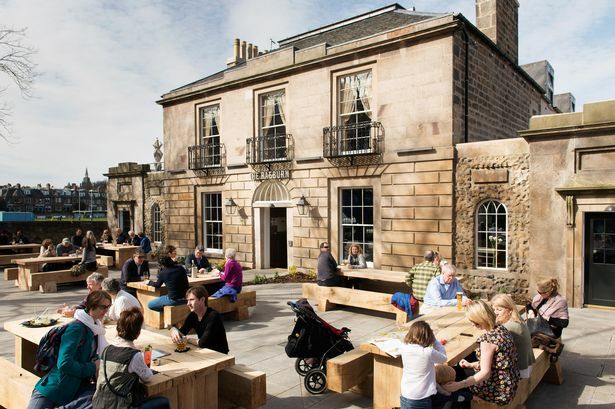 A clear vision for the reinvention of Raeburn House was key to its success: A Restaurant with Rooms appealing to city visitors and residents from around this cultural district of gift shops, galleries, quality food shops, pubs, cocktail bars and bistros. A farmer’s market on Sundays draws a huge crowd. 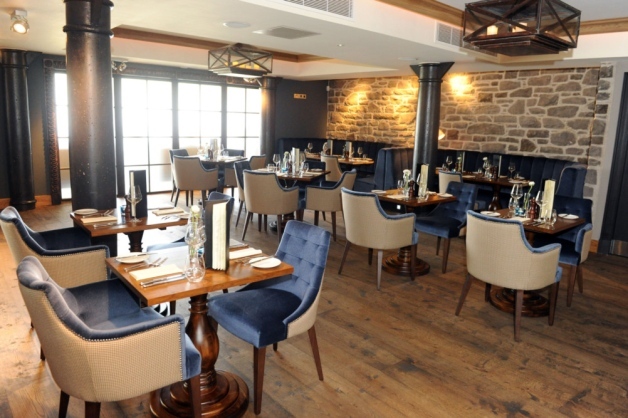 8.30pm – dinner in the Brasserie; thick stone walls, artisan wood flooring, tweed and leather fabrics, booths, armchairs and oak tables, it’s like a modern Urban Inn. With a small army of staff, service is friendly and knowledgeable; we settled in to study the menu, a wide choice of starters and mains as well as speciality Steaks. Head Chef Pavel Broz and his team offer fresh and seasonal Scottish cuisine where the provenance of produce is clearly given. Limouson –Angus beef from the Tweed Valley, East Lothian vegetables, North Sea and West Coast seafood, fine cheese. The kitchen also supports the local neighbourhood fishmonger and butcher. We dined on superb home-cured and smoked Trout, sweet Seared Scallops, an exceptional Cod dish, and a tasty Wild Mushroom ragout. The Cheese board as we finished off our soft, velvety French Pinot Noir. The Bar serves lighter meals of everyone’s favourite dishes – soup, salads, burgers, steak, pasta. Drinks include classic cocktails, beers & craft ales from Scotland, Belgium and USA. Thankfully, there’s no TV showing endless News and Sports – just occasional screenings of Rugby and Tennis. For a birthday party, leisure or business event, you can reserve the Library and Private Dining Room. 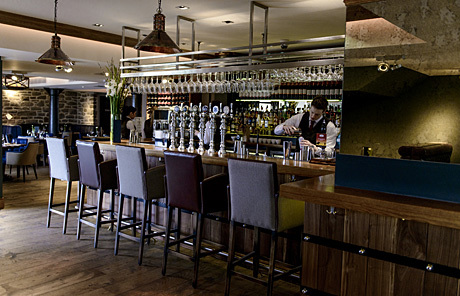 On Sundays, the Raeburn quite rightly reflects a lazy day of eating out with friends – Brunch and traditional Roast Beef as part of an all-day lunch menu. This is also a family, child and dog friendly place. After a comfortable night’s sleep and power shower to wake us up, time for Breakfast: freshly baked croissants, healthy Granola with yogurt and berries, then perhaps Bacon Roll, Eggs Benedict or the delicious Vegetarian platter. Breakfast is popular with non-residents too, served from 7am to 12 noon. The professional standard is exemplary, from a welcome smile on arrival to smooth, seamless service and Hospitality with a capital H. Creating the right ambience is an allusive ingredient. Here, the staff are having as much fun serving, as we are sipping our ice chilled Martinis….. 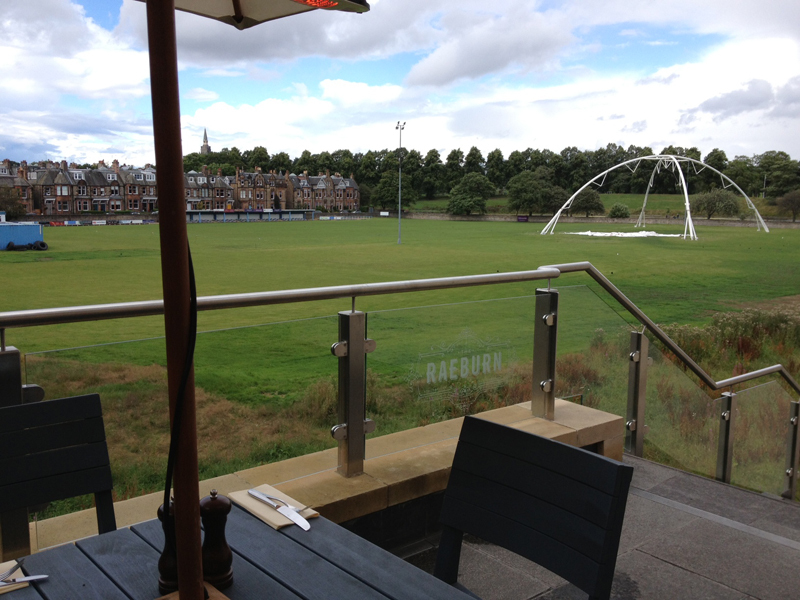 The Raeburn has been a smash hit since day one, a buzzing place to eat and drink, morning noon and night. With a touch of casual sophistication, it’s contemporary with vintage style. 3 F words to describe our experience = Fun, Fabulous, Faultless. But what do other guests say? We stayed at the Raeburn for one night during the festival; from the minute we were welcomed to the minute we left were treated like royalty. I would recommend this hotel to anyone who enjoys the luxury of things a quality hotel should deliver. The Raeburn delighted with ease. The Raeburn Hotel is WONDERFUL!! I will totally stay here again!! Top notch. So why not plan your visit soon …..